The most commonly described motor proteins belong to the Myosin superfamily. Different motor protein functions of the myosin family. A. Myosin I can bind to membrane lipids. B. Bundles of Myosin II slide along the actin cytoskeleton network to drive actomyosin contractility. C. Myosin V transports cargo by ‘walking’ l along actin filaments. Myosin I has unique tail domain(s) relative to other myosin members which allows myosin I to bind to membrane lipids or to more than one actin filament at a time (see panel ‘A’ in Figure below). Myosin I is primarily involved in intracellular organization, but it also forms a critical component of small cell surface projections in intestinal cells. Myosin II can form higher order assemblies via the extended coiled-coil domains in the heavy chains. For example, the long coiled-coil domains of myosin II interact with the coiled-coiled domains of adjacent myosin II molecules, followed by additional tail-tail interactions with other myosin II assemblies. The resulting myosin II bundle (aka ‘”thick filament”) has several hundred myosin heads oriented in opposite directions at the two ends of the filament. Concerted ATP hydrolysis and movement of the myosin heads along adjacent actin filaments generates a sliding motion that results in shortening or contraction of the interlinked actin filaments (see arrows in panel ‘B’ in Figure below). The action of the actin-myosin system generates forces against the interlinked cytoskeleton network to influence processes such as cell signaling, adhesion, movement, polarity, and cell fate (see “contractile bundle” in the main glossary)  (reviewed in ). Myosin II is also a critical component of stress fibers and the contractile ring that separates two cells during cell division. For studies which investigate cell contraction and motility, contractile force generated by myosin II can be inhibited using small molecules such as blebbistatin  and 2,3-butanedione monoxime (BDM) . Myosin V and Myosin VI In non-muscle cells, actin filaments form an internal track system for cargo transport that is powered by motor proteins such as myosin V and myosin VI ( see panel ‘C’ in Figure below); these myosins use the energy from ATP hydrolysis to transport cargo (such as attached vesicles and organelles) at rates much faster than diffusion. 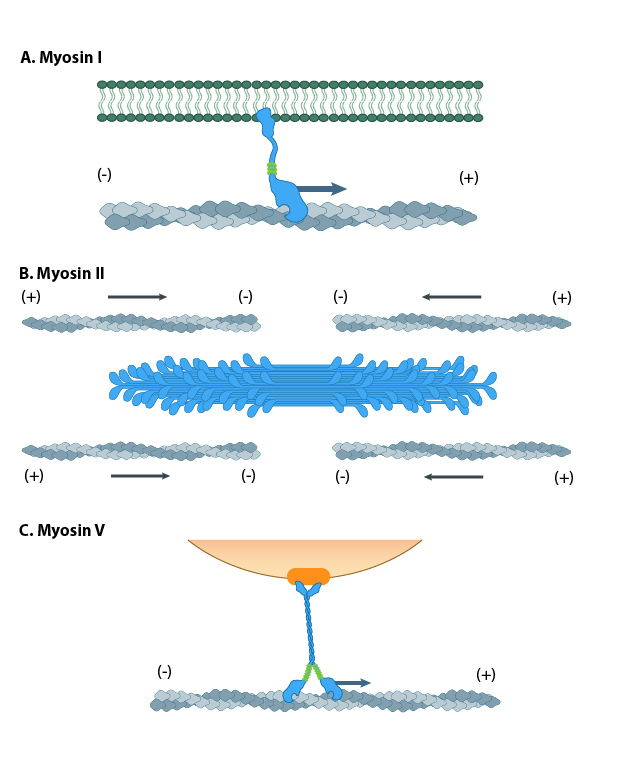 Myosin V contains more light chains and a longer ‘lever arm’ relative to myosin II, which allows myosin V to move in larger steps along the actin filaments (reviewed in ). Myosin V may also colocalize with F-actin bundles. The distribution of myosin V in growth cones is consistent with the role for this myosin in tension production by growth cones. Myosin V may influence the filopodial extension rate by pushing the plasma membrane and creating space for G-actin subunit assembly onto the barbed ends of actin filaments . Myosin VII and Myosin X are important for filopodial assembly and dynamics . Myosin VII is believed to influence the assembly/disassembly of adhesion proteins at the filopodial tip  as well as play a role in filopodial extension events. Myosin X activity also influences the filopodia number and overall length with calmodulin-like protein (CLP) modulating this activity by stabilizing myosin X . Myosin X influences transport of materials along filopodial shafts using an ATP-dependent ‘walking’ mechanism. Myosin X binds cell surface receptors, cytoskeleton, Ena/VASP proteins, and membrane phospholipids . Myosin X also has a striking distribution at the tips of filopodia and disrupting its function disrupts filopodium formation . Several myosin isoforms have been found in eukaryotes, each differing in the type of heavy and light chains they are composed of. All myosins are composed of a diverse ‘tail’ domain at their carboxy terminus and an evolutionarily conserved globular ‘head’ domain at their amino terminus. All myosins share a motor domain on their heavy chains at the amino-terminus (the ‘head’ domain), but they differ considerably at their carboxy-terminus (the ‘tail’ domain). A few myosin types also have an amino-terminal extension. The number of light chains varies considerably between myosin types and certain myosins exist as dimers. Myosins that form dimers have two motor domains, and the number of light chains can influence the “lever arm” length between the myosin heads – this regulates the length of the myosin ‘powerstroke’ and the distance the myosin can travel along the actin filament in a single round of ATP hydrolysis (see also ‘myosin powerstroke’). The diverse ‘tails’ of different myosin isoforms bind specific substrates or cargo, whilst their conserved ‘heads’ contain sites for ATP binding , F-actin binding and force generation (i.e. motor domains) (reviewed in ). All myosins bind to actin filaments via a globular ‘head’ domain located at the end of the heavy chains. Actin binding to this region increases the ATPase activity of myosins (reviewed in . Some myosins have a single heavy chain and contact actin filaments at only one site, while other myosin isoforms have two heavy chains and contact actin filaments at two sites. Myosin II is the only family member that can form polymeric assemblies ) (See “thick filaments” below). 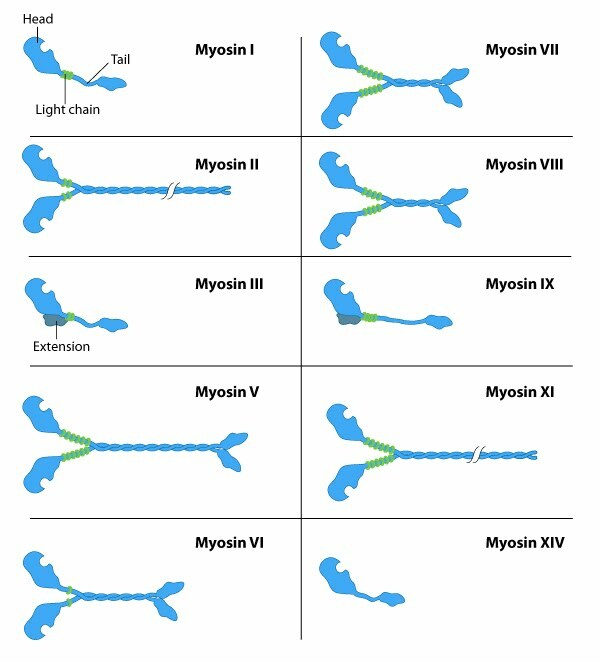 The number of light chains influences the length of the “lever arm” or “neck region” and therefore the “step size” of different myosin types . Myosin V contains more light chains relative to myosin II and so myosin V moves in larger steps along actin filaments after an equivalent round of ATP hydrolysis (reviewed in ). Myosin motors move along actin filaments in defined directions. With the exception of myosin VI, which moves towards the pointed end, all myosins move towards the barbed end. Most actin filaments have the barbed end directed towards the plasma membrane and the pointed end towards the interior. This arrangement allows certain myosins (e.g. myosin V) to function primarily for cargo export, while myosin VI acts as the major motor protein for import. Myosin II is commonly associated with retraction fibers and retrograde actin flow at the pointed end of actin filaments. All non-muscle cells use contractile bundles containing myosin II to generate forces that promote the assembly of actin filaments. Although most myosins function as motor proteins in the cytoplasm, some species of myosin are localized to, and function in, the nucleus. 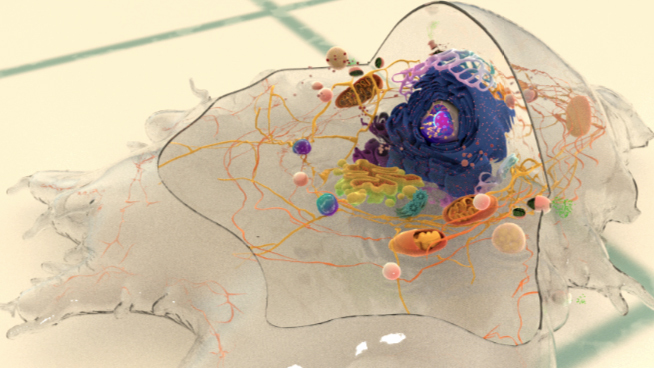 Nuclear Myosin I (NMI), myosin II, myosin V, myosin VI, myosin XVIB and myosin XVIIIB have all been found in the nucleus , with NMI being the most extensively studied.